flat assembler - Fresh IDE v2.5.0 RC Even more changes. 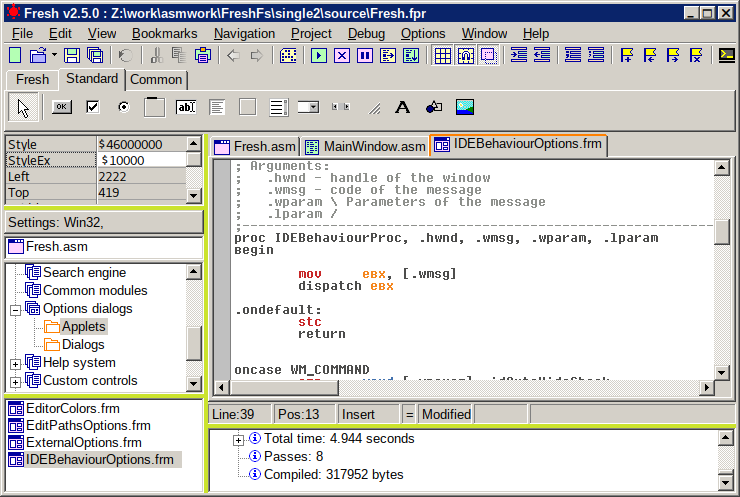 flat assembler > IDE Development > Fresh IDE v2.5.0 RC Even more changes. Because of the big code base changes, I am releasing it as a RC version in order to be tested. For the previous v2.4.0RC, I didn't received even single test report. Hope with this release, as a very long awaited change, the reaction will be more enthusiastic. I remember this bug. I think it is fixed now. I totally forgot about drag-drop operations. And there are several of them. Thanks for the report. Will fix them. @idle - on what OS you are testing? I can reproduce the problem only in WINE. In windows-7 the drag-drop operations work fine. I am asking, because if you have the problem in WINE only, it will need one kind of fix (actually work-around WINE bug) and if you experience the problem in some Windows version, the problem will need future investigation and it is really bug in Fresh IDE. i use winxp with fresh located in "d:/Мої Документи/fresh/" folder. John, an option of slight highlight of current carret line is appreciated. TG, why dont you too? So, there is some problem in Fresh IDE. I will work on it. OK, I have two bugs in this version. 2.) Instant crash with a newly created project when choosing my MainFile.asm as the project main file. 2. Save the project file somewhere. 3. Choose any .asm file as your main file. Interestingly, the crash does not happen without a project file. @ProMiNick: The problem with the compilation time is probably not in Fresh IDE itself. I tried to reproduce it, but without any success. In my tests the total compilation time is something like 3 seconds on much slower CPU. Is this huge time consistent on your system? Do you have AV scanner and is it possible the formatter stage to be blocked by it, scanning the compiled file and/or the generated .fas file? Also, please give me some details about the computer - the available RAM, the CPU and the type of HDD. I can reproduce the crash on the listing generation and it will be fixed. @jazz - You are probably talking about the file open dialogs in the "Project" menu. If so, it is confirmed and will be fixed. Unfortunately I can't reproduce the bug with the crashing on adding the main file to the project . But I am testing in WINE. Will try again in Windows. Hope will diagnose and fix it as well. Friends, thanks for the tests and the reports! Tell me if I can help to find the crash. @jazz - The address where the exception happens or even stack dump always can help. If Windows 10 hides this information, you can try running Fresh IDE in OllyDbg and check whether the bug still persists and where the crash happens. Of course the trick with the debugger will help only if it is not a heisenbug. I'll x64dbg it when I'm back home. No crash when running inside x64dbg. @jazz So, it is classic heisenbug. These are often related to memory allocations/reallocation issues. So, I inspected the project manager code for wrong handling of memory and indeed found an issue that possibly can cause such crash. Hope fixing this issue will fix the discussed bug as well. Will try to test one more time in Win10 before the official release. 3. Open the file "source/Fresh.fpr" and compile. Notice that the above link points always to the latest version of the branch "single2" where 2.5.0 is developed (see the URL address).